As of February 2015 Darlene and I became Buckeys again. We are currently residing in Liberty Township Ohio (Cincinnati area) which now allows us to visit family more often, and finally get to see them Grandkids more. It also allows me to start riding on some of my favorite roads in SW Ohio. I was honored to be my Dads guardian on an Honor Flight with the Tri State Group. (Cincinnati). and praying I make my way through the white out conditions on RT 31 by 22:00 (Which by the has a nice bypass around Kokomo now). I went back up to South Bend airport around 13:00 today to return the rental, and find my van. 2009, Starting It Off In The Snow! What a trip. Ron Bien, and his wife went with me and Dar to go visit the James Gang in Michigan. They live in Waters Michigan, up there near Gaylord. Beautiful vacation place on the lake is now their retirement home, where Steve and his family have been enjoying for 38 years now. In the winter it’s a snow mobile haven. I never knew how many trails there were in the US for snow mobiles. On day one we did 70 miles of unmapped trails, and on day 2 we did 100 miles of the groomed, mapped routes with plenty of snow. Temps were in the single digits for the most part, and got up as far as 12 or so, and when we were riding, we were sweating. We were nice and warm with all the right clothes on. This was my second visit there for snowmobiling and I was getting a little cocky and trying to keep up with the big boys. I ended up in the snow 3 times. The first was the funniest. We stopped for a break, and I walked in front of Ron’s sled and tripped right over the rail and went face first in about 15″ of snow. I when I finally got back up (bundled in clothes) I opened my face shield and all this snow came out. What a riot. 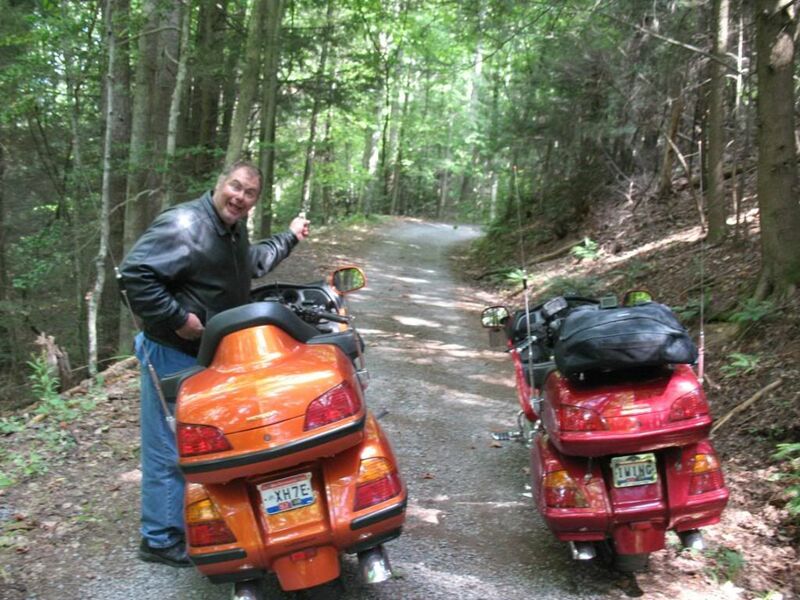 Then next was when Steve and I was getting on it in the twisties and lost it in a curve. He went in the ditch, I spun out trying to avoid him and the ditch and flipped it. Could of been worse. We were ok, my sled got a little banged up. When I say “my sled” I mean the one I was riding which belongs to Doug, Steve’s brother. The third was when we were going up, then down a step hill, and I let her rip on the way down, hit a rut, and it bounced me right off. I’m getting too old for this self abuse. I’m paying for it now, but dang was that fun! Here’s a few pic’s. Winter ain’t all bad sometimes. 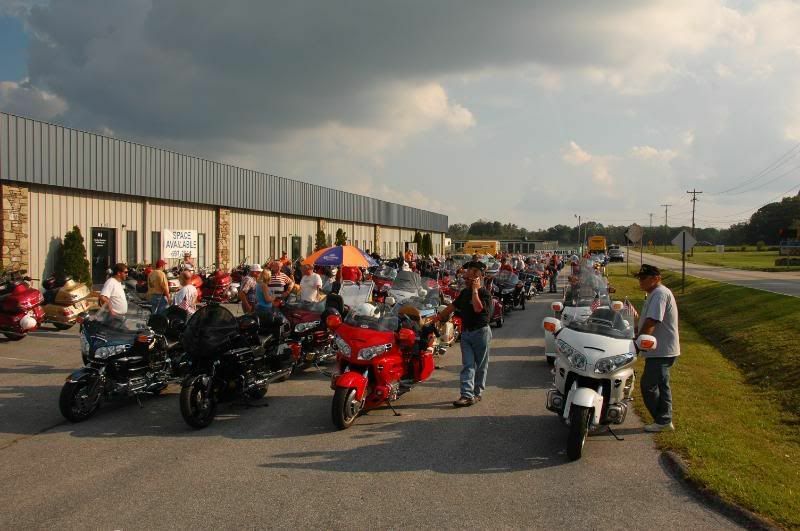 Wings Over The Smokies (WOTS) was one of the rally’s I used to attend. It’s in a beautiful area, and is outdoors. Well, I don’t go to rallies anymore, but I still go to Hendersonville NC during the rally each year. Why? Honda Direct Line has a customer appreciation BBQ, and I like to go to meet up with some old friends, and find some new ones as well. Ron Bien, Steve James, Steve Snead, Ross Randall and myself left Harrison, Ohio to take 2 days and all back roads down to Hendersoville, NC. 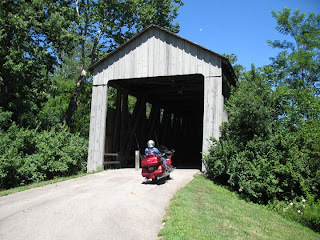 Ron and I have been looking around on some covered bridge web sites, and thought we’d put together a ride visiting some of these bridges along the way. 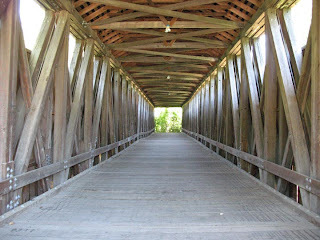 One thing we found is there is a very liberal definition over “covered bridge”. Some we past were merely little bridges in a back yard crossing a creek someone built, or a play ground that has a toy covered bridge, and a couple were on a golf course for decoration. No real historical value. Some did though, and were pretty neat finds. 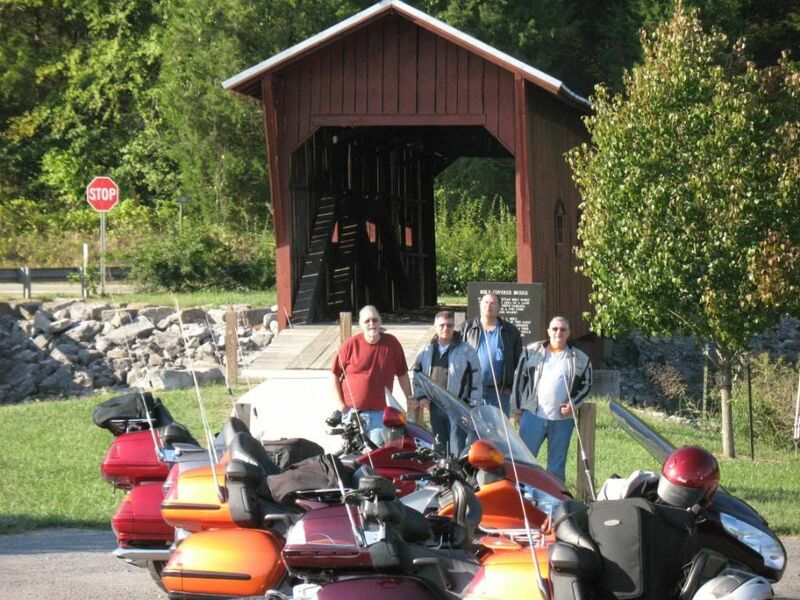 This is Emerets Cove covered bridge crossing the Littl Pigeon River. The roads we took down there were awesome. Lots of twisticles, and off the beaten path. Just the way I like it. You really see more of America that way. Some of the roads looks like someones driveway, so Steve James started calling these “Greg’s driveway ride”. There’s different web sites out there to find coivered bridges. One of them I use is US Covered Bridges which also has downloadable .gbd files you can use as waypoints on your GPS. Ohio Barns has a lot more than just barns. 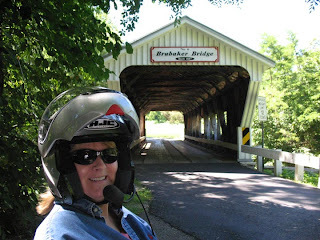 Today, Darlene and I took a short little ride today doing an Oxford loop, In this loop we worked in 4 covered bridges. One of which (south of Oxford) didn’t qualify in my opinion. It was more like a deck in a back yard. I should of stoppe to take a picture. Here’s a couple I did shoot. 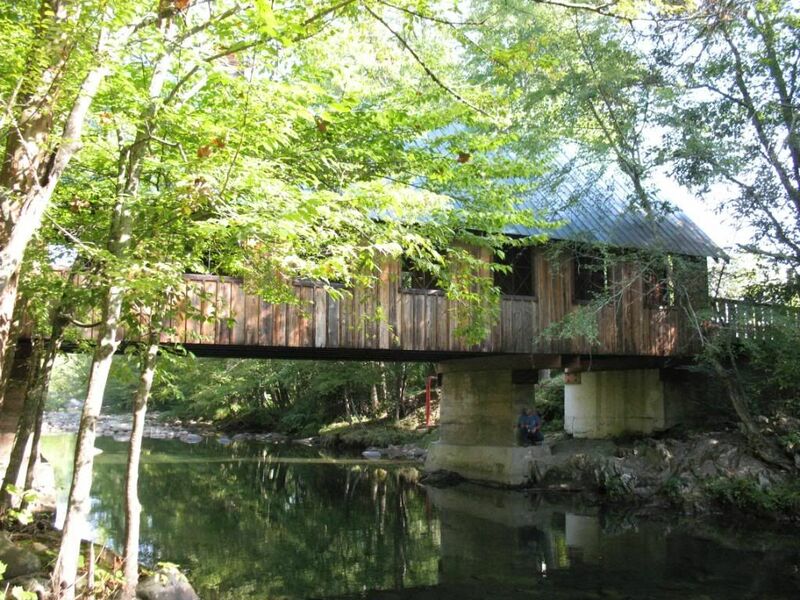 This one is in Oxford called Pugh’s Mill and the only one still on it;s original spot in Butler County. Bulit in 1868 – 1869. 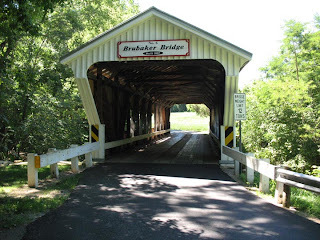 Then we headed on up to Gratis to cross Brubaker’s Covered Bridge.